Past and present Reformed Theological Seminary (RTS) professors came together to produce a new pair of Old and New Testament introductions with Crossway. These “Biblical-Theological” introductions are intended for pastors and general readers, and are made by scholars who are “appreciative of dogmatics” (p10) — that is, unafraid of systematic theology — and who uphold biblical inerrancy and Reformed theology. 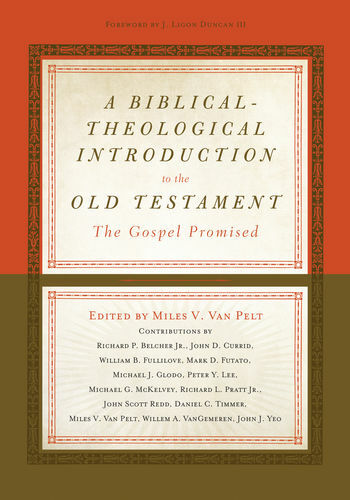 In this post I will review A Biblical-Theological Introduction to the Old Testament, edited by Miles Van Pelt. In addition to the above points, what sets apart A Biblical-Theological Introduction to the Old Testament (what a mouthful), is that the authors not only want to present the message(s) of each individual OT book, but to do so “in the context of the whole canon of Scripture”, including the “authoritative witness of the New Testament”, which provides “the full and final message of the Old Testament” (p13). This means that the treatment of individual book incorporates insights from the rest of the OT and the NT, hence the title of the book. Yet another feature that sets this work apart is the approach of the editor, Miles Van Pelt. Van Pelt has a keen interest in reading the Old Testament as a unity, particularly by following the Hebrew canonical order rather that of modern English Bibles (see more here and here). The Introduction reproduces his material from the excellent and popular BiblicalTraining lectures on the subject. If the very structure of the Bible is significant, then each book’s location is relevant for “[discovering] its full and final significance” (p30). Van Pelt’s material here is excellent and I am glad to see it reach a wider audience. Those in the know may wonder why Van Pelt does not follow the (slightly different and arguably more ancient) order from the Baba Bathra like Dempster and DeRouchie, but unfortunately he does not address this question. After the Introduction, each OT book is examined, following the Hebrew OT order. Each chapter includes usual topics such as authorship and dating, but most attention is devoted to the book’s message and theology, with some chapters summarizing the book’s contents. Despite Van Pelt’s earnest presentation and defense of the Hebrew OT order, and structuring of the book around this order, the individual authors themselves did not devote much attention to their respective book’s Hebrew-order placement. Most ignored the issue entirely. However, unsurprisingly, Van Pelt’s chapter on Song of Solomon is an exception. On that note, the chapter on Song of Solomon was undoubtedly my favourite. This is because I have always struggled to understand the book, but Van Pelt’s perspective (known as the three-character view) was eye-opening and has sparked my own study of the book to see if it is the best way to read it. It goes without saying that a book from Reformed Theological Seminary professors will have all the trappings of Reformed theology, such as Covenant Theology, Calvinism, Infant Baptism, the Tripartite division of the Law, and so on. However, non-Reformed readers should not let this dissuade them. Since this book covers the Old Testament, I did not find myself frustrated on every page despite disagreeing with (while being highly appreciative of) much in Reformed theology. Odd are the two appendices by Richard Belcher: an exhaustive comparison of approaches to the Seventy Weeks of Daniel 9, and a discussion of the role of heavenly beings in Daniel. Though these appendices are strong in their own right, they seemed parochial and narrow for an OT intro, where topics such as OT textual criticism, the Septuagint, or the Ancient Near East would more broadly useful. In comparison, the companion NT introduction discusses general topics applicable to NT study, such as the NT canon, textual criticism, the Synoptic problem, and the use of the OT in the NT. A Biblical-Theological Introduction to the Old Testament is a fine addition to the admitted wealth of OT introduction texts available. With a solid lineup, A Biblical-Theological Introduction to the Old Testament is very approachable for the general reader who wants to get to the heart of OT books and their message(s). Those interested in issues such as provenance, textual criticism, and cultural backgrounds will want to find additional resources, but as an introduction to the Old Testament that focuses on the message and theology of the books themselves, A Biblical-Theological Introduction to the Old Testament is a highly recommended addition for any library. Many thanks to Crossway for providing a review copy through their Beyond the Page program.